If you want to upgrade your flat screen TV for a large 90" to 120" picture, the LG Laser Smart Home Theater Projector (model HF85JA) may be just the ticket. This ultra short throw projector sits right under the screen so it takes up little mounting space and delivers a nice big screen theater experience in a dark room. The BIG difference between this and most home theater projectors is that it has all the connections that a regular TV does including a direct antenna connection and a built-in tuner. The HF85JA is basically a Full HD 1920x1080 TV in a small package, and it acts just like one of LG's smart TVs. With a tuner onboard it projects live TV (WebOS 3.0 compatible), Web surfing, music and video playback, photo slide shows, and it has USB inputs for viewing a variety of file formats. It is wireless, Ethernet, and Bluetooth capable, so projecting from mobile devices is easy using utilities like Miracast. Its internal dual 3-watt speakers are adequate for a small room, but the HF85JA is equipped with Bluetooth audio output that eliminates the need for a cable, or if you prefer there is an optical digital audio output, either of which are perfect for external audio amplification. Not only does it give you a 90" to 120" diagonal picture, but its laser light source gives you 20,000 hours of viewing time. That means you'll never have to change a lamp. Another handy and very unique feature of the LG HF85JA is its "Magic Remote". Once coupled to the projector, the remote displays a cursor on the image which can be maneuvered exactly like a mouse for easy selection of menu functions and projector modes. The HF85JA's video images are smooth and evenly lit with a remarkable 81% brightness uniformity, which is exceptional for an ultra short throw projector. Contrast is pleasing and sufficient for dark room viewing. 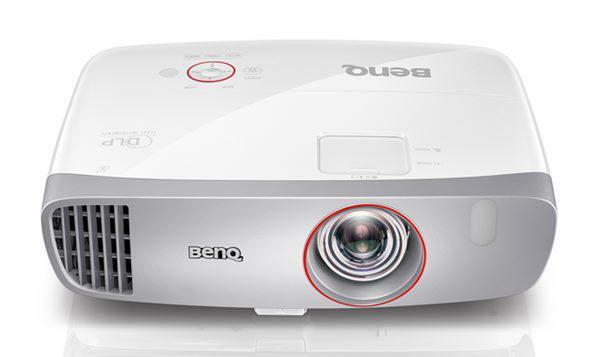 Black levels are adequate but not comparable to other projectors in this price class. The color temperature adjustment from Cool to Medium to Warm to Natural was gradual and effective. There are six picture modes available, and while image changes were subtle between most modes, the Cinema mode definitely renders the image with a very pleasant theater-like experience. Unlike many DLP projectors, the HF85JA exhibited very few rainbow artifacts often seen in high contrast scenes, especially when slow panning was taking place. While the HF85JA works well with movies and video, data image projection is not its strong suit. It is difficult to focus precisely across the entire screen and when you are displaying static graphics or text documents instead of video this becomes more noticeable. Alphanumeric characters and graphical elements were hard to read while using small fonts and at full keystone correction. Brightness. LG rates the HF85JA at 1500 lumens. 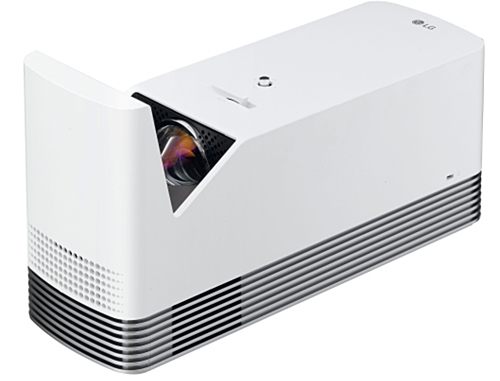 It is important to note that LG sets its official lumen ratings by factoring in the idea that a laser-driven projector will deliver higher brightness as perceived by the human eye than a lamp-based projector with the same ANSI lumen meter reading. 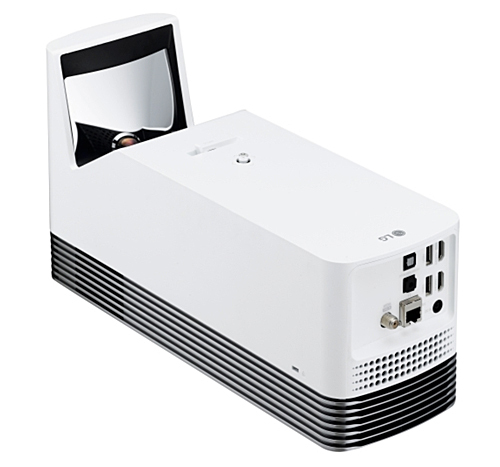 Since LG's lumen rating is intended to be an estimated "subjectively perceived brightness" equivalent to lamp-based projectors it is typical for our ANSI lumen readings on LG projectors to be lower than the published specifications. There is no practical way to make an adjustment to the meter readings to account for this difference in perceived brightness. Color Brightness. In all color modes, the HF85JA's color brightness was about 68% of its white brightness. Eco Mode. Although fan noise is already low in Normal mode, Eco mode lowers it to a whisper with a 25% reduction in brightness. There is no indication that Eco mode extends illumination system life, so we suspect most users will opt for Normal mode since fan noise is not distracting. Brightness uniformity. Brightness uniformity measured 81% which is better than most UST projectors, and even better than many conventional front projection products. Luminance variation is barely noticeable on a static data presentation, and it is undetectable with video content. Fan noise. The HF85JA's fan noise is very low in Normal mode and is composed of low and medium frequencies that are not distracting. In Eco mode, fan noise is virtually undetectable. Since the HF85JA is positioned very close to the screen and heat is exhausted from the side of the projector, it is unlikely that fan noise in any illumination mode will be an issue. Input Lag. The measured lag time is 58 ms in all modes. Lamp Life. The rating for the laser light engine is 20,000 hours. That is the equivalent of operating the HF85JA for eight hours a day, five days a week for about ten years. You will probably be watching a new projector long before the HF85JA's illumination system fails. Warranty. LG warrants the projector for one year. When setting up an Ultra Short Throw projector, it is imperative that you use a screen that is uniformly flat. Any screen waviness will distort the image since the image is projected from such an acute angle upward. Pop-up screens will not suffice. The best screens are mounted on a rigid frame and tensioned evenly on all sides. It is also important to orient the projector perpendicular to the screen. Any vertical or horizontal offset will cause significant image keystoning. Of course, most projectors like the HF85JA offer keystone correction, but they inevitably reduce image resolution. You would like to be able to display a 1920x1080 HD signal using a one-to-one pixel match with the 1920x1080 display, but keystone adjustments introduce scaling that defeats this. The projector can be ceiling-mounted if desired, but it must be located not more than one foot above the screen, so an extension tube may be needed if the top of your screen is not near the ceiling. One of the beauties of the HF85JA is that it can be easily positioned right under a screen, which eliminates the cost and hassle of a ceiling mount. So we doubt many users will go with the ceiling mount option. Image Size. Image size ranges from 90" to 120" and can only be changed by moving the HF85JA closer to or farther from the screen. Throw Distance. At the minimum image size (90"), the front edge of the HF85JA is about 3" from the screen. At maximum image size (120"), the case is approximately 8" from the screen. On-board Audio and Audio Output. The HF85JA's built-in dual 3-watt speakers are adequate for a small room, and they are buzz- and rattle-free over their entire range. However, it also has Bluetooth audio output, a rare feature on a home theater projector that eliminates the need for an audio cable. Or you can use the optical digital audio output. Either of these can be used to drive a good sound bar or external speaker system for the best listening experience. The big picture produced by the HF85JA is best enjoyed with complementary big sound. The LG Laser Smart Home Theater Projector (model HF85JA) is a versatile Ultra Short Throw projector that gives you a picture at least 90" and no more than 120" diagonal, which is two to three times the surface area of a 70" TV. The trade-off decision is easy ... the 70" flat screen is for family room ambient light use, and the HF85JA is for the much larger screen theater experience in the dark. The LG HF85JA is all about ease of use and easy installation. Since it weighs less than 7 lbs it is much easier to get in the door and set up than a big screen TV. You can project onto a smooth white wall if you want to, but you'll get an even better viewing experience when using a fixed frame screen with solid black borders--video always looks better in a frame. The HF85JA functions nicely for movies, video, smart TV and WebOS 3.0, and it can display pictures from any video source including gaming consoles, computers, and mobile devices. The Bluetooth audio output makes connection to a Bluetooth enabled external sound system a snap. And the Magic Remote that puts a cursor on the screen rounds out the list of features that don't normally appear on a home theater projector. The LG HF85JA is list priced at $1,799, but at this writing, LG is offering a promotional price of $1,599.99. That is higher than many other 1080p home theater projectors, but many of them need to be ceiling mounted and none of them have the variety of smart TV and other unique features that come with the HG85JA. All things considered, this is a unique offering at a very attractive price.